As avid science-fiction fans and graduate and undergraduate students of anthropology, we cannot help but notice whenever an anthropologist graces our TV screen during a Star Trek episode or mentioned in a task force to interface with alien populations. We also can’t help analysing the representations our discipline and practitioners, and, falling victim to déformation professionnelle, writing about it extensively. In this series, our aim is to explore the representations of anthropologists and their work in various works of the science-fiction genre. Who are the anthropologists in scifi? How do they interact with alien populations? How do their actions mirror or undermine the actual methodologies of anthropologists in the field? What sorts of people are anthropologists depicted as, and how does this reflect ongoing projects in public anthropology? Our hope is to use science fiction as a framework through which to examine contemporary concerns and research questions in anthropology as well. In order to keep the series dynamic, we chose to break it down into a dialogue. Each week, one of us will publish a piece on which the other two authors will respond on the following days. While writing this series, we have found that working in such a way offers several advantages. It makes the research and writing process much faster and easier, as we do not attempt to combine our three voices and our different backgrounds and approaches into a united text. Additionally, commenting on each other’s pieces allowed us to maintain a high level of creativity, as reading our colleague’s ideas helped us develop new ones. Finally, working as a trio combines our respective strengths and knowledge of various science-fictions works. While we share a passion for several franchises examined in this series, Rayna and Marie-Pierre rely more heavily on movies and TV series, while Emma focuses her attention on sci-fi literature. The cases we discuss in the series are taken from franchises such as, Avatar, Doctor Who, the Ender’s Game series, Indiana Jones, Stranger in a Strange Land, Stargate SG-1 and Stargate Atlantis, Star Trek: The Next Generation, Star Trek: Deep Space Nine and Star Trek: Into Darkness, to name only these few. We occasionally draw on examples from other genres (Vampire Diaries, Bones) and will address the relevance of these in the conclusion to the series. 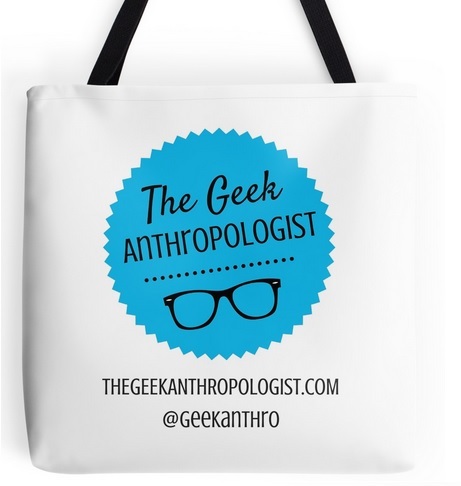 Don’t miss a single installment of this series: make sure you follow The Geek Anthropologist! Check out the Anthropology in Outerspace page to add examples of representations of anthropology in science-fiction you can think of. We also hope that the series will promote conversation within a larger community of social scientists and science fiction fans. Considering the scope of our series, there are doubtless many examples of anthropological representations or issues we had to overlook. Please feel free to comment with your own suggestions, queries and additional analysis throughout the series of Anthropology in Outerspace, even outer spaces.